Update: EA and BioWare have put out a full list of all the changes coming in the Anthem day one update, which has gone live a bit early as of right now,, and it is extensive. The biggest tweaks and improvements were already laid out in the original version of this story which you can read below, but based on further play experience for the Anthem review-in-progress, we can note at least one more big one: replacing the missing primer/detonator icons for several pieces of gear. If you haven't played yet, trust us, keeping tabs on all your primers and detonators is important. Original story: It's always nice to see a developer reacting so quickly to all the community feedback, and in the case of the various Anthem problems, I doubt anyone at BioWare is getting any sleep right now. The team are busy working away on patching out several of the major bugs in the game, and are all over social media working to inform players exactly what's being worked on. This includes general performance improvements for all platforms, such as smoother frame rate, fixed hitches and so on too. 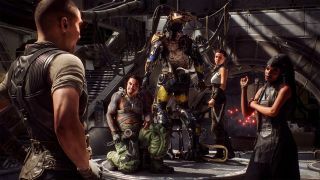 If you've been playing Anthem over the past couple of days, you'll know the now almost infamous Anthem Tomb challenge that asks you to tick off a load of freeroam activities, including getting a certain number melee kills, multi-kills and even opening 15 Anthem treasure chests. Well, you'll be pleased to hear that BioWare is working on a few workarounds for this mission, including the idea that progress for these challenges will start tracking earlier, meaning you'll earn progress towards the challenges starting at level 3, as explained by BioWare on Reddit. Apparently this is a fix that's been actually pushed out now. 1. If you gained access to one of the Legionnaires Tombs but there is no interaction on the Tomb, please restart freeplay and make your way back to the Tomb. 2. If your journal is telling you that the challenges are complete but the Tomb door doesn't open as it should, please go to the Challenges section of your journal and check that the challenge criteria is completed. In some cases we have seen the journal display misleading information at this step. Completing the challenges as they appear in the challenge section should allow access to the Tombs. If you've ever been shot by an enemy that takes a while to actually appear, this is a problem that's happening to a lot of players. It's to do with the streaming, and is worsened if you have a slower or fuller hard drive. If you're noticing crashes when trying to talk to people in Fort Tarsis, this is another thing that will be fixed with the Day One patch. Apparently it's linked to faction point accrual. The number of loading screens in Anthem can be ridiculous, and it's even worse when they don't ever complete. Apparently this is much rarer than it was in the demo - and I must admit it hasn't happened to me in the full release - but is something that will totally be removed with the Day One patch. Audio dropping out for anyone else? Anthem just ain't the same without the smashing of Javelin metal and the brap of guns. Thankfully those audio drop issues are going too. Ah the treasure chests. Once the bane of my life, are now just a sweet loot drop. But for those of you coming to them fresh this Friday, February 22, you'll be pleased to hear that ticking off the opening a chest challenge will no longer be limited to the one who actually opens the chest itself. "Opening chests (counting challenges) will have a large radius. If anyone in your squad opens it, you should get credit for the open," said BioWare Lead Producer, Michael Gamble on Twitter. Some players have noticed issues with streaming and loading data when playing Anthem from a HDD rather than an SSD, so this is something that's being looked into with the Day One patch. That'll be very handy for users who aren't running the game from an SSD, for example, anyone with a HDD plugged into their Xbox One or PS4 for game storage.